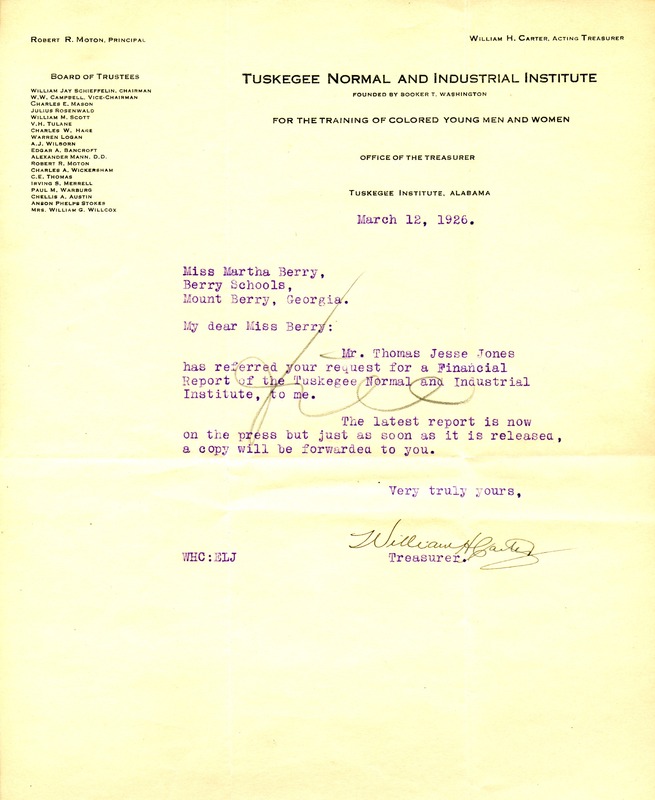 Letter to Martha Berry from William H. Carter informing her that her request for a financial report of the Tuskegee Normal and Industrial Institute had been referred to Mr. Thomas Jesse Jones. They inform Miss Berry that the last report is on the press and that as soon as it is released that one will be sent to her. William H. Carter, “Letter to Martha Berry from William H. Carter.” Martha Berry Digital Archive. Eds. Schlitz, Stephanie A., Haley Fortune , et al. Mount Berry: Berry College, 2012. accessed April 18, 2019, https://mbda.berry.edu/items/show/3455.